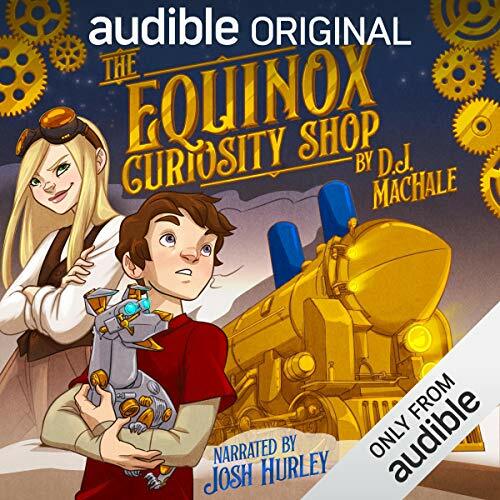 Exclusively on Audible, an original from D. J. MacHale, New York Times best-selling author of the Pendragon series, for ages 8 and up. Eleven-year-old Sam Calico is an excellent storyteller, inventing wild escapades, but has never had the courage to have a real adventure of his own. That is until one day when a mysterious invitation arrives along with a mechanical dog, inviting him to the Equinox Curiosity Shop - which happens to be in an abandoned building. Despite his fears, Sam follows the instructions and boards a train to the magical Equinox Valley, where he discovers that the Nexus, which holds the world in equilibrium, is under attack. With the help of some magical toys, Sam has only 24 hours to stop the evil Khord and her twin monkeys, Castor and Pollux, from destroying Equinox Valley and his home outside along with it. D. J. MacHale is the creator of Nickelodeon's Are You Afraid of the Dark? and The Outerbounds, coming soon from Amazon Studios. ©2018 D. J. MacHale (P)2018 Audible Originals, LLC. Eleven-year-old Sam Calico is an excellent storyteller, inventing wild escapades, but has never had the courage to have a real adventure of his own. That is until one day when a mysterious invitation arrives along with a mechanical dog, inviting him to the Equinox Curiosity Shop - which happens to be in an abandoned building. Despite his fears, Sam follows the instructions and boards a train to the magical Equinox Valley, where he discovers that the Nexus, which holds the world in equilibrium, is under attack.